A second key witness in Oscar Pistorius’ trial has told the court in Pretoria she was awoken by the sounds of a fight early on February 14, 2013. Paralympic champion Oscar Pistorius, 27, has pleaded not guilty to intentionally killing his girlfriend, Reeva Steenkamp. Oscar Pistorius shot dead Reeva Steenkamp, 29, at his home, saying he mistook her for an intruder. His neighbor, Estelle Van Der Merwe, said the row had lasted about an hour. “It seemed like somebody was involved in a fight,” said Estelle Van Der Merwe, who lives in the same gated Pretoria housing estate as Oscar Pistorius. The argument woke her at about 01:56 local time and lasted about an hour. After that, she heard four loud sounds in succession. Estelle Van Der Merwe was the second witness to take the stand at the murder trial of Oscar Pistorius, which began at the high court in on Monday. She said she had been irritated by the noise of the argument and placed a pillow on her head “in hope of falling asleep again”. Tuesday’s hearing adjourned not long after the third witness, Charl Peter Johnson – husband to the first witness Michelle Burger – had taken the stand. The second day of the trial began with defense lawyer Barry Roux quizzing Michelle Burger about her account of hearing a woman’s screams, a man calling for help and then four gunshots. The defense line was clear that as Reeva Steenkamp was in a closed toilet with a closed window, the screams the witness said she heard could not have come from her. Oscar Pistorius was in the bathroom where the window was open so the screams must have come from him. Barry Roux also suggested expert evidence would prove that Reeva Steenkamp would have been unable to scream between shots. When details of the bullets hitting her head were read out, Oscar Pistorius’s head dropped into his hands. At the start of proceedings on Monday, Barry Roux read out a statement from the athlete, giving his version of events of how Reeva Steenkamp had died, saying he believed his girlfriend was in bed when he shot at the toilet door. 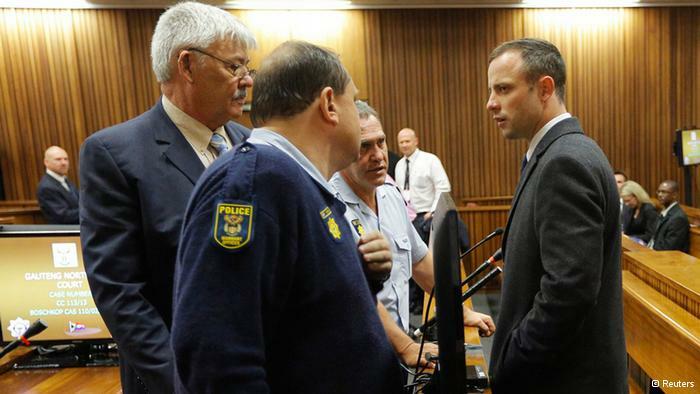 State prosecutors say Oscar Pistorius planned the killing and shot Reeva Steenkamp after a row.